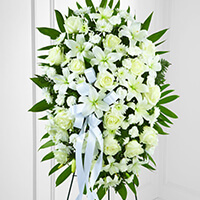 Provide comfort for the family of Ursula Betz with a meaningful gesture of sympathy. Tante Musch and family sent flowers to the family of Ursula Betz. Someone so special can never be forgotten. She will be forever in our hearts. Tante Musch and family purchased the The FTD Exquisite Tribute Standing Spray for the family of Ursula Betz.